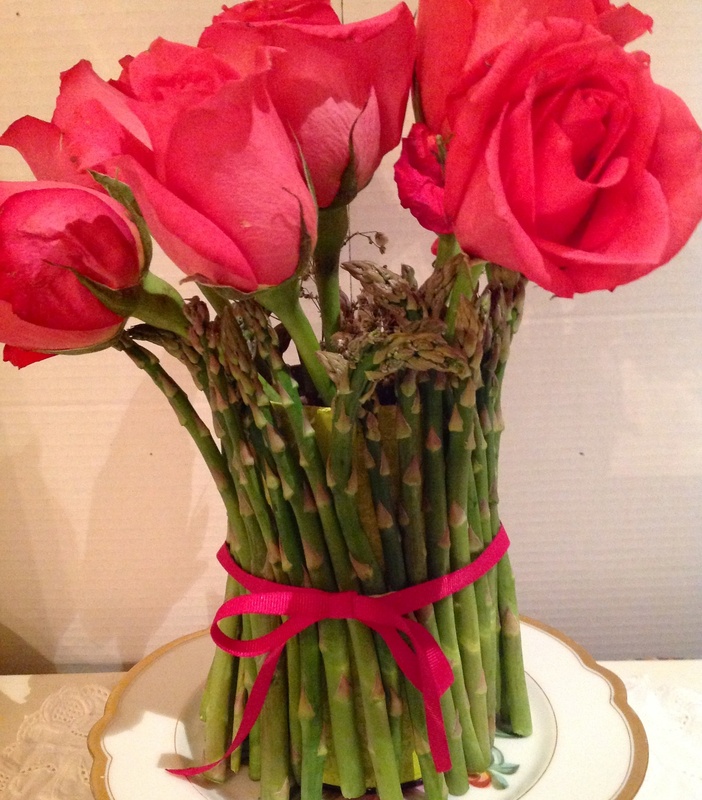 Asparagus and Roses DIY Centerpiece: From Supermarket to Wow! Taking inspiration from the produce section, here is an easy spring centerpiece for your table which will give asparagus a starring role. You will need a bunch of supermarket flowers of all one type, a bunch of asparagus, a cylindrical container with straight edges at least 6 inches tall, an elastic band and a decorative ribbon. I used a tea tin and placed a glass inside to hold the water as I did not have a vase with flat sides. 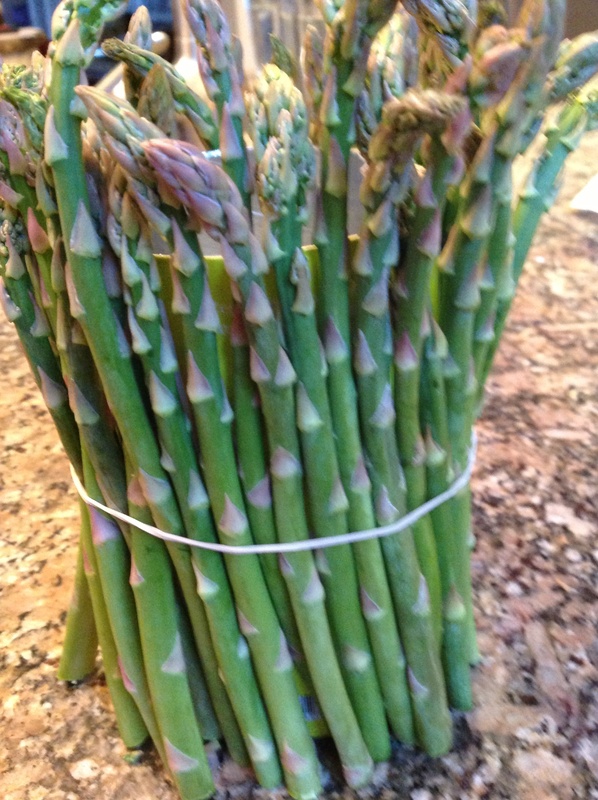 Cut the asparagus about an inch and a half beyond the height of your vase, so the spears project beyond the top edge. 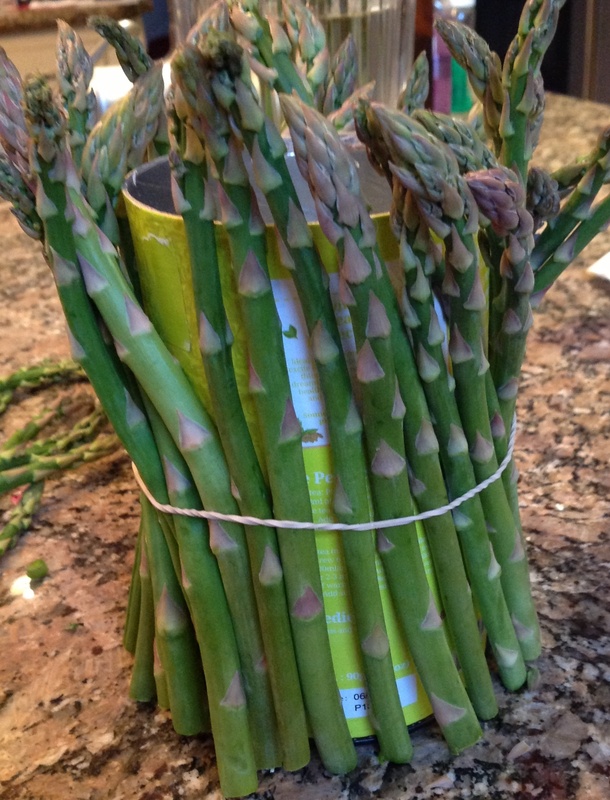 Using an elastic band to hold the asparagus in place as you work, place the asparagus along the side of the vase until you have covered your vase completely. 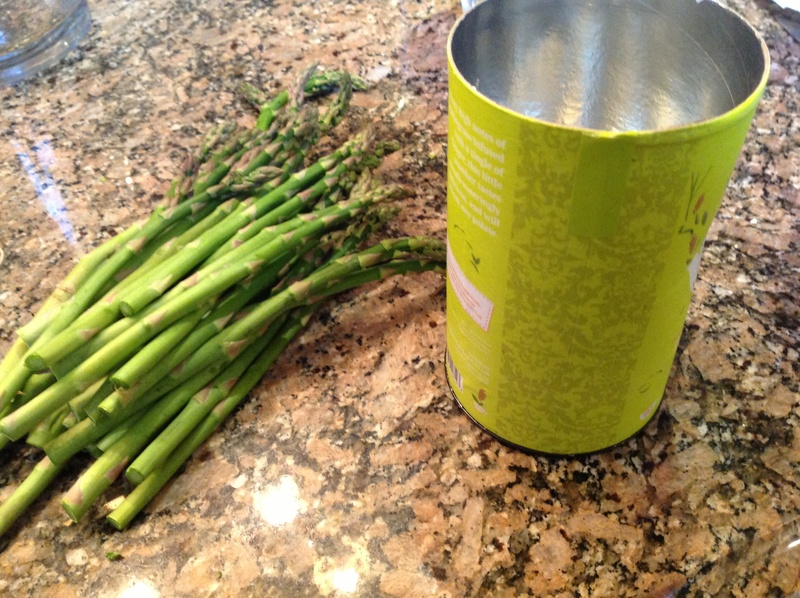 You will need to straighten the asparagus as you work so it stands upright. 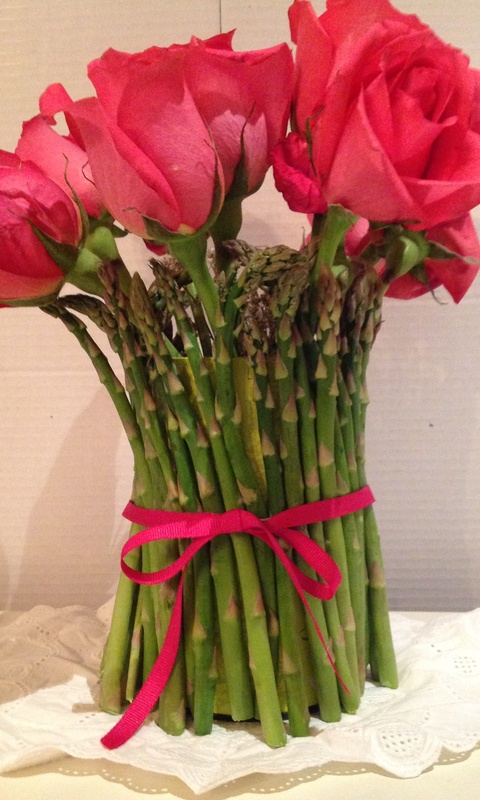 Cut your flowers so they sit just above the top edge of your asparagus. Add a decorative ribbon to conceal the elastic band, add water, and voila! A lovely seasonal arrangement which will be sure to receive many compliments. If using right away, this arrangement can sit directly on the table. If made ahead more than a few hours, or if you plan to eat the asparagus at a later date, it is best to place the arrangement in a shallow dish of water to keep the asparagus from wilting. Fun, easy and wow-worthy. And this asparagus? Gave it another starring role in an omelet! Thanks for visiting today. This entry was posted in Uncategorized and tagged Elevating supermarket flowers, Mixing vegetables and flowers on the table, Vegetable centerpiece by Johanne Lamarche. Bookmark the permalink. Beautiful and so creative! Spring incarnate. Oh, yeah! Oh, yeah! This is my idea of double-duty!!! Display the asparagus, then eat it!!! What a neat centerpiece!!! I wish I would have seen this before eating up all the asparagus we bought on sale. It was all the way down to just $1.29 lb., but has since jumped up to twice that. Glad we got our fill of it, but sad I wasn’t able to create something like this!!! Pinning it!!! Hey, Johanne…have a really Happy Easter weekend, my dear! I hope you feel all the joy and love that our Lord died for us to enjoy. Take care!